An opening flashback shows Lois answering a question from Jon: "Who's faster, Superman or the Flash?" Lois answers Jon correctly, and then finds Clark who is home to surprise her. They wonder if Jon may manifest abilities like Superman, but are content to not know for the nonce. The story returns to the present where Jon has evidenced powers and uses them to help himself and Lois escape a fiery death. Superman arrives after defeating Blackrock, and saves Lois and Jon from Intergang men who look to finish what the fire couldn't. Jon reacts to the revelation of is father being Superman, and while Lois and Superman try to explain, Superman is beset with visions and must away to confront what has been presaged to him. All the while Hyathis draws closer to the mate of the Oblivion Stone. Story - 4: The scene between Jon, Lois, and Clark is well-handled. What could have been a cringe-worthy exchange came across excellently for a couple of reasons: Jurgens knows how to write in the voice of a child. An extremely powerful child, but a young boy nonetheless. Jon displays the fluid emotions of a kid, moving from glee, to indignance, to curiosity, but through it all, he channels the balance of his father, which is displayed as well in the issue. When Superman takes apart Blackrock, he does so both literally and figuratively. Displaying a spark of indignance when learning that situation was created for a mere television show. He dispatches Blackrock, and his umbrage for more important things, just as Jon lets go his outrage for the important questions that he needs to pose and have answered. It's a very fine parallel, and that serves to connect Jon and Clark more so than the abilities that they each possess. Jurgens wisely interrupts the dialogue, as it's not a conversation that can be delivered to satisfaction in a few panels, and there is still plenty of story to happen in this and next issue. It was nice to see Lois answer the question of who's faster, Superman or the Flash, definitely and correctly. Adventures of Superman #463 gave the Flash a well-deserved win, and since then, it's been forgotten that the Flash barely won that race. It's the only race that the Flash has ever won against Superman, and the best of the lot. However, the idea that Superman isn't as fast as the Flash is a notion that needs to be challenged and challenged regularly. Superman, who is always as strong, fast, as powerful as he needs to be, yet somehow lesser to the Flash in speed, comes from the grace that Dan Jurgens bestowed in the aforesaid issue, for if the Flash couldn't be the Fastest Man Alive, what status could he muster other than second best? Still, this grace has been misused to the point even Superman readers don't think he could ever be as fast as the Flash, when he's obviously faster. Jurgens reminds readers of that yesteryear grace, but as no grace has been offered in return, it's time that those who've benefited from the largesse of Superman, such as Batman and the Flash, to start earning it rightfully without the aid of the Miller Formula or Jurgen's Grace. Art - 3: The book suffers this month from too many hands. 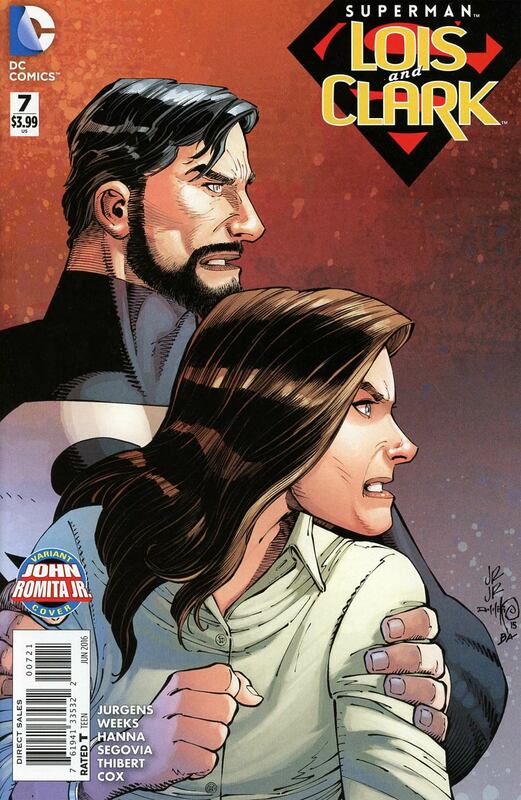 Superman: Lois and Clark is best when Lee Weeks is front and centre and Scott Hanna embellishing his line work. What we received here was fine in some places, excellent in others, and messy in a few. It's never a bonus to have a mixed bag when it comes to the art of the story. Cover Art - 4: The pose, the colors, etc., really make one want the true outfit to be back on display. 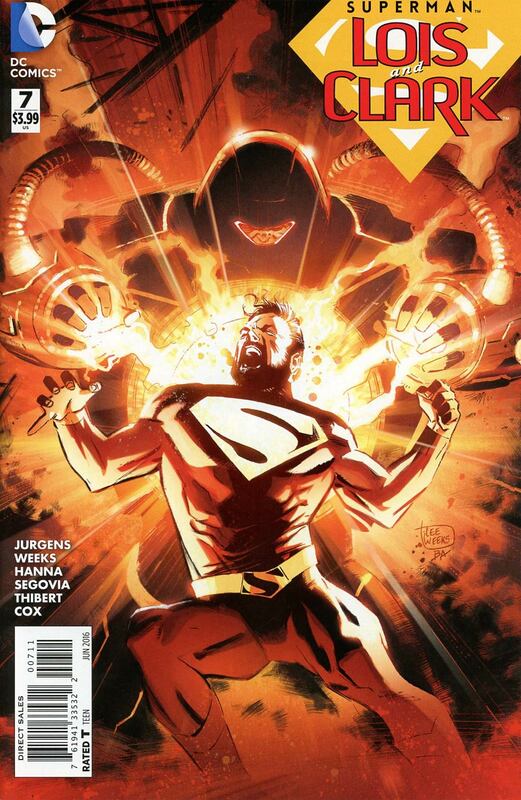 It's a dynamic cover, but the black, capeless union suit just doesn't say "Superman".